Roy Wheeler Realty Co. MLS# 588629 - 104 Berwick Cir, Charlottesville, VA 22901 - Roy Wheeler Realty Co.
Hidden gem in Albemarle. 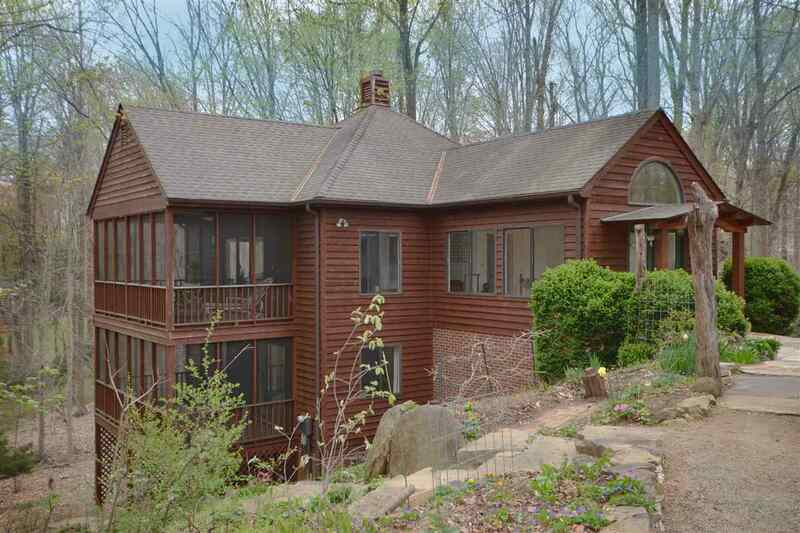 Enjoy over an acre of natural beauty and privacy, just minutes to town and amenities. Unique character includes a charming garden, woods, gorgeous stone steps and patio, a custom cherry wood portico, heart pine floors, and two 19×10 screened porches. Dramatic foyer opens to eat-in kitchen with pantry, formal dining, and living room with fireplace. Porch off living room invites in the sights and sounds of nature. Master bedroom with walk in closet shares lower porch with another bedroom. Spacious rec room, with full bath and rear yard access, is perfect for exercise, play, crafts, or 4th bedroom. Plenty of storage. Established raised beds and flower, herb, and fruit plants. This peaceful setting can be your home! Directions: From Rt.29 North: Right on Carrsbrook Dr. Right on Westmoreland Rd. Right on Berwick Ct. Right on Berwick Circle to end of cul de sac. Or, from East Rio Rd go north on Old Brook Rd to left on Berwick Court to right on Berwick Circle.